For my sins I run an after school Craft Club which started two years ago following requests from pupils to learn to knit, sew and crochet. I’m more of an enthusiastic amateur than an expert, but I enjoy having a go! We’ve got several members, boys and girls, in fact our champion knitter is a boy and he’s pretty good at cross stitch too! Barbara’s school craftivism project – great way to get notice from politicians. Fingers crossed it reachers David Cameron’s office. Being unable to crochet, I had to draft in our technology technician, Hazel, to help me out. Two years on I still can’t crochet, but that’s because I never get a minute to try, I’m usually untangling someone’s knitting, threading needles or looking for buttons! I think it’s really important for children to realise that one person can make a difference; it’s no good sitting back and saying ‘yes, that’s awful but I can’t do anything’, if everyone did that nothing would ever get done! 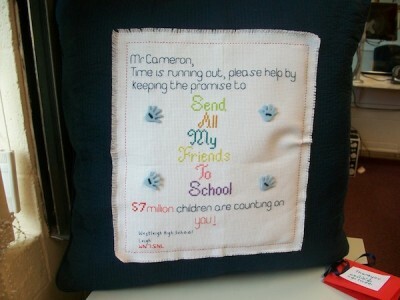 A cushion for their MP Andy Burham- that won’t get lost underneath letters or emails will it?! That leads us quite nicely to our first attempt at becoming ‘Craftivists’. Every year my classes take part in the Send My Friends To School campaign. Back in the year 2000, world leaders promised that, by 2015, every child would have access to a primary school education. Time is running out and there are still 57 million children who can’t go to school. Every year the campaign has a different focus, this year it is disabled children. We are asked to produce a piece of art work, this year a paper chain made up of individual ‘buddies’ to which we add a message to the Prime Minister. We’ve also written letters to our local M.P. the Queen and the Prime Minister. We’ve even managed to persuade the players at our local Rugby League club, Leigh Centurions, to make their own buddies to send to Downing Street. My Craft Club decided that we really ought to make sure our work stands out from the rest this year. We came up with the idea of sewing our letter to David Cameron. We then decided to make it into a cushion so that it couldn’t get ‘lost’ under a pile of paperwork. 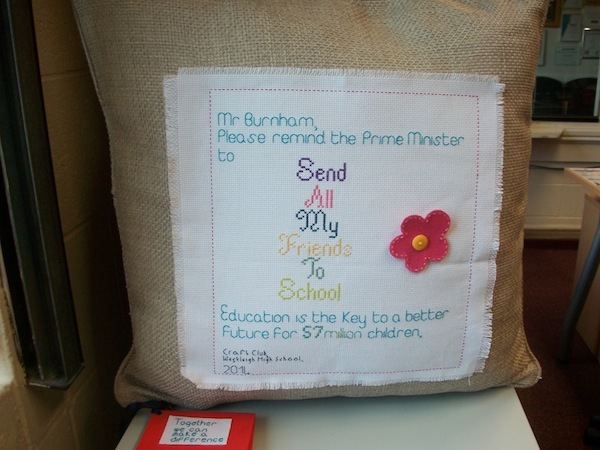 We made another cushion for our M.P., Andy Burnham, just so he didn’t feel left out. We’re busy collecting all our letters and buddies together to deliver to our M.P. We’ll ask him to take them to London to give to the Prime Minister in June. Hopefully, they both will use the cushions to decorate their offices and be reminded of the campaign at the same time. Our next project is already planned; we’re going to make the Craftivist Collective’s mini protest banners, just as soon as Hazel and I have taught a few more pupils to sew!